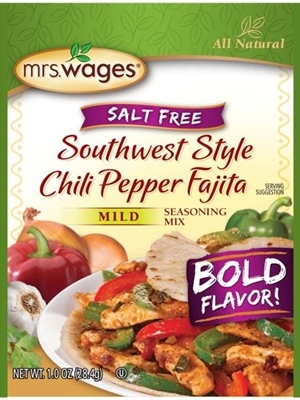 Mrs. Wages Southwest Style Chili Pepper Fajita Seasoning Mix mix offers a bold flavor with a mild heat level and is SALT FREE! Heat 1 Tbsp oil in a large skillet over medium-high heat. Add chicken and cook until done. Remove from skillet and keep warm. Add remaining oil and vegetables to skillet. Cook and stir 4 minutes or until tender. Return chicken to skillet. Stir in water and seasoning mix. Bring to boil; reduce heat and simmer 5 minutes or until thickened. Serve on flour tortillas with favorite toppings. DEHYDRATED VEGETABLES (ONION, CHILI PEPPER, GARLIC, GREEN & RED BELL PEPPER), SPICE, CORN STARCH, CITRIC ACID, SOYBEAN OIL, YEAST EXTRACT, PARSLEY, LESS THAN 2% SILICON DIOXIDE (ANTICAKING).